The Konica Minolta Bizhub C3850 colour A4 multifunction laser printer is a fast and environmentally efficient black and colour printer. Offering print, copy, scan and fax functions, the Konica Minolta C3850 multifunction printer uses Simitri HD toner to print brilliant reports, charts, presentations, marketing materials and even photos. The Bizhub C3850 A4 colour multifunction printer has a sleek dark cabinet unit with a compact footprint and uses the INFO-palette design that we’ve become accustomed to seeing on new Minolta MFP’s. It weighs 47.6kg and the Konica C3850 colour laser copier has dimensions of 555 x 584 x 603mm. 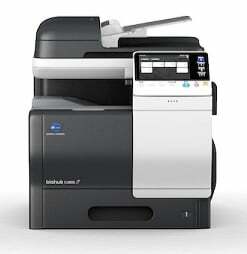 The speedy and compact Konica Minolta Bizhub C3850 printer can reach speeds of 38ppm and has good eco performance. The large 7-inch colour touch panel is very innovative and improves the printer's appearance. Each of the original Konica Minolta Bizhub C3850 toner cartridges lasts for 10,000 pages to help increase workflow while reducing the cost-per-page. There’s a 50-shett ADF and 1024MB of memory on the powerful Bizhub C-3850 MFP. Although the Bizhub C3850 colour laser printer can print at high-speed this is only possible when printing at 600 x 600dpi and output speed drops when the machine is printing at a higher resolution of 1200 x 1200dpi.